This step-by-step guide describes how to plan the deployment of Azure Active Directory (Azure AD) Privileged Identity Management (PIM) in your organization. These are general recommendations, and you should only implement if they apply to your specific enterprise needs. Azure AD Privileged Identity Management (PIM) helps you to manage privileged administrative roles across Azure AD, Azure resources, and other Microsoft Online Services. In a world where privileged identities are assigned and forgotten, PIM provides solutions like just-in-time access, request approval workflows, and fully integrated access reviews so you can identify, uncover, and prevent malicious activities of privileged roles in real time. Deploying PIM to manage your privileged roles throughout your organization will greatly reduce risk while surfacing valuable insights about the activities of your privileged roles. Manage risk - Secure your organization by enforcing the principle of least privilege access and just-in-time access. By minimizing the number of permanent assignments of users to privileged roles and enforcing approvals and MFA for elevation, you can greatly reduce security risks related to privileged access in your organization. Enforcing least privilege and just-in-time access will also allow you to view a history of access to privileged roles and track down security issues as they happen. Address compliance and governance - Deploying PIM creates an environment for on-going identity governance. Just-in-time elevation of privileged identities provides a way for PIM to keep track of privileged access activities in your organization. You will also be able to view and receive notifications for all assignments of permanent and eligible roles inside your organization. Through access review, you can regularly audit and remove unnecessary privileged identities and make sure your organization is compliant with the most rigorous identity, access, and security standards. Reduce costs - Reduce costs by eliminating inefficiencies, human error, and security issues by deploying PIM correctly. The net result is a reduction of cyber crimes associated with privileged identities, which are costly and difficult to recover from. PIM will also help your organization reduce cost associated with auditing access information when it comes to complying with regulations and standards. For more information, see License requirements to use PIM. eligible A role assignment that requires a user to perform one or more actions to use the role. If a user has been made eligible for a role, that means they can activate the role when they need to perform privileged tasks. There's no difference in the access given to someone with a permanent versus an eligible role assignment. The only difference is that some people don't need that access all the time. activate The process of performing one or more actions to use a role that a user is eligible for. Actions might include performing a multi-factor authentication (MFA) check, providing a business justification, or requesting approval from designated approvers. just-in-time (JIT) access A model in which users receive temporary permissions to perform privileged tasks, which prevents malicious or unauthorized users from gaining access after the permissions have expired. Access is granted only when users need it. principle of least privilege access A recommended security practice in which every user is provided with only the minimum privileges needed to accomplish the tasks they are authorized to perform. This practice minimizes the number of Global Administrators and instead uses specific administrator roles for certain scenarios. For more information, see Terminology. PIM is set up so that users are eligible for privileged roles. When an eligible user needs to use their privileged role, they activate the role in PIM. Once the user successfully activates their role, they will get the role for a pre-configured time period. Administrators can view a history of all PIM activities in the audit log. They can also further secure their tenants and meet compliance using PIM features like access reviews and alerts. Azure AD roles – These roles are all in Azure Active Directory (such as Global Administrator, Exchange Administrator, and Security Administrator). You can read more about the roles and their functionality in Administrator role permissions in Azure Active Directory. For help with determining which roles to assign your administrators, see least privileged roles by task. Azure resource roles – These roles are linked to an Azure resource, resource group, subscription, or management group. PIM provides just-in-time access to both built-in roles like Owner, User Access Administrator, and Contributor, as well as custom roles. For more information about Azure resource roles, see role-based access control (RBAC). For more information, see Roles you cannot manage in PIM. This section focuses on what you need to do before deploying PIM in your organization. It is essential to follow the instructions and understand the concepts in this section as they will guide you to create the best plan tailored for your organization’s privileged identities. The following section helps you identify all the stakeholders that are involved in the project and need to sign off, review, or stay informed. It includes separate tables for deploying PIM for Azure AD roles and PIM for Azure resource roles. Add stakeholders to the following table as appropriate for your organization. As part of the planning process, you must first consent to and enable PIM by following our start using PIM document. Enabling PIM gives you access to some features that are specifically designed to help with your deployment. If your objective is to deploy PIM for Azure resources, you should follow our discover Azure resources to manage in PIM document. Only owners of each resource, resource group, and subscription will be able to discover them inside PIM. If you are a Global Administrator trying to deploy PIM for your Azure resources, you can elevate access to manage all Azure subscriptions to give yourself access to all Azure resources in the directory for discovery. However, we advise that you get approval from each of your subscription owners before managing their resources with PIM. It is important to make sure that you have enforced the principle of least privilege in your organization for both your Azure AD and your Azure resource roles. For Azure AD roles, it is common for organizations to assign the Global Administrator role to a significant number of administrators when most administrators only need one or two specific administrator roles. Privileged role assignments also tend to be left unmanaged. The administrator in charge of Exchange is given the Global Administrator role even though they only need the Exchange Administrator role to perform their day to day job. The Global Administrator role is assigned to an Office administrator because the administrator needs both Security and SharePoint administrator roles and it is easier to just delegate one role. The administrator was assigned a Security Administrator role to perform a task long ago, but was never removed. Follow these steps to enforce the principle of least privilege for your Azure AD roles. Understand the granularity of the roles by reading and understanding the available Azure AD administrator roles. You and your team should also reference administrator roles by identity task in Azure AD, which explains the least privileged role for specific tasks. List who has privileged roles in your organization. You can use the PIM wizard to get to a page like the following. For all Global Administrators in your organization, find out why they need the role. Based on reading the previous documentation, if the person’s job can be performed by one or more granular administrator roles, you should remove them from the Global Administrator role and make assignments accordingly inside Azure Active Directory (As a reference: Microsoft currently only has about 10 administrators with the Global Administrator role. Learn more at how Microsoft uses PIM). For all other Azure AD roles, review the list of assignments, identify administrators who no longer need the role, and remove them from their assignments. To automate steps 3 and 4, you can utilize the access review function inside PIM. 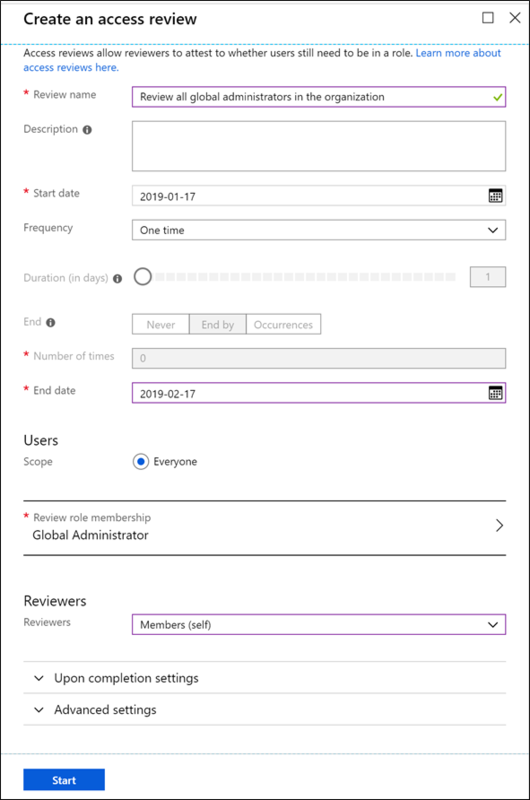 Following the steps in start an access review for Azure AD roles in PIM, you can set up an access review for every Azure AD role that has one or more members. You should set the reviewers to Members (self). This will send out an email to all members in the role to get them to confirm whether they need the access. You should also turn on Require reason on approval in the advanced settings so that users can state why they need the role. Based on this information, you will be able to remove users from unnecessary roles and delegate more granular administrator roles in the case of Global Administrators. Access reviews rely on emails to notify people to review their access to the roles. If you have privileged accounts that don’t have emails linked, be sure to populate the secondary email field on those accounts. For more information, see proxyAddresses attribute in Azure AD. For Azure subscriptions and resources, you can set up a similar Access review process to review the roles in each subscription or resource. The goal of this process is to minimize Owner and User Access Administrator assignments attached to each subscription or resource as well as to remove unnecessary assignments. However, organizations often delegate such tasks to the owner of each subscription or resource because they have a better understanding of the specific roles (especially custom roles). If you are an IT administrator with the Global Administrator role trying to deploy PIM for Azure resources in your organization, you can elevate access to manage all Azure subscriptions to get access to each subscription. You can then find each subscription owner and work with them to remove unnecessary assignments and minimize owner role assignment. Users with the Owner role for an Azure subscription can also utilize access reviews for Azure resources to audit and remove unnecessary role assignments similar to the process described earlier for Azure AD roles. After cleaning up privileged role assignments in your organization, you will need to decide which roles to protect with PIM. If a role is protected by PIM, eligible users assigned to it must elevate to use the privileges granted by the role. The elevation process may also include obtaining approval, performing multi-factor authentication, and/or providing a reason why they are activating. PIM can also track elevations through notifications and the PIM and Azure AD audit event logs. Choosing which roles to protect with PIM can be difficult and will be different for each organization. This section provides our best practice advice for Azure AD and Azure resource roles. ✔️ Microsoft recommends you manage all your Global Administrators and Security Administrators using PIM as a first step as they are the ones that can do the most harm when compromised. It is important to consider what data and permission are most sensitive for your organization. As an example, some organizations may want to protect their Power BI Administrator role or their Teams Administrator role using PIM as they have the ability to access data and/or change core workflows. If there are any roles with guest users assigned, they are particularly vulnerable to attack. ✔️ Microsoft recommends you manage all roles with guest users using PIM to reduce risk associated with compromised guest user accounts. Reader roles like the Directory Reader, Message Center Reader, and Security Reader are sometimes believed to be less important compared to other roles as they don’t have write permission. However, we have seen some customers also protect these roles because attackers who have gained access to these accounts may be able to read sensitive data, such as personally identifiable information (PII). You should take this into consideration when deciding whether reader roles in your organization need to be managed using PIM. If you are a Global Administrator having trouble deciding which subscriptions/resources are most important, you should reach out to subscription owners in your organization to gather a list of resources managed by each subscription. You should then work with the subscription owners to group the resources based on severity level in the case they are compromised (low, medium, high). You should prioritize managing resources with PIM based on this severity level. ✔️ Microsoft recommends you work with subscription/resource owners of critical services to set up PIM workflow for all roles inside sensitive subscriptions/resources. PIM for Azure resources supports time-bound service accounts. You should treat service accounts exactly the same as how you would treat a regular user account. For subscriptions/resources that are not as critical, you won’t need to set up PIM for all roles. However, you should still protect the Owner and User Access Administrator roles with PIM. ✔️ Microsoft recommends you manage Owner roles and User Access Administrator roles of all subscriptions/resources using PIM. Once you have decided the list of roles to be managed by PIM, you must decide which users should get the eligible role versus the permanently active role. Permanently active roles are the normal roles assigned through Azure Active Directory and Azure resources while eligible roles can only be assigned in PIM. ✔️ Microsoft recommends you have zero permanently active assignments for both Azure AD roles and Azure resource roles other than the recommended two break-glass emergency access accounts, which should have the permanent Global Administrator role. Frequency of elevation – If the user only needs the privileged assignment once, they shouldn’t have the permanent assignment. On the other hand, if the user needs the role for their day-to-day job and using PIM would greatly reduce their productivity, they can be considered for the permanent role. Cases specific to your organization – If the person being given the eligible role is from a very distant team or a high-ranking executive to the point that communicating and enforcing the elevation process is difficult, they can be considered for the permanent role. Before you implement your PIM solution, it is good practice to draft your PIM settings for every privileged role your organization uses. This section has some examples of PIM settings for particular roles (they are only for reference and might be different for your organization). Each of these settings is explained in detail with Microsoft’s recommendations after the tables. The following table describes each of the settings. Role Name of the role you are defining the settings for. Require MFA Whether the eligible user needs to perform MFA before activating the role. ✔️ Microsoft recommends you enforce MFA for all administrator roles, especially if the roles have guest users. Notification If set to true, Global Administrator, Privileged Role Administrator, and Security Administrator in the organization will receive an email notification when an eligible user activates the role. Note: Some organizations don’t have an email address tied to their administrator accounts, to get these email notifications, you should go set an alternative email address so administrators will receive these emails. Incident ticket Whether the eligible user needs to record an incident ticket number when activating their role. This setting helps an organization identify each activation with an internal incident number to mitigate unwanted activations. ✔️ Microsoft recommends taking advantage of incident ticket numbers to tie PIM with your internal system. This is particularly useful for approvers who need context for the activation. Require approval Whether the eligible user needs to get approval to activate the role. ✔️ Microsoft recommends you to set up approval for roles with the most permission. Based on usage patterns of all PIM customers, Global Administrator, User Administrator, Exchange Administrator, Security Administrator, and Password Administrator are the most common roles with approval setup. Approver If approval is required to activate the eligible role, list out the people who should approve the request. By default, PIM sets the approver to be all users who are a privileged role administrator whether they are permanent or eligible. Note: If a user is both eligible for an Azure AD role and an approver of the role, they will not be able to approve themselves. ✔️ Microsoft recommends that you choose approvers to be those who are most knowledgeable about the specific role and its frequent users rather than a Global Administrator. Activation duration The length of time a user will be activated in the role before it will expire. Permanent admin List of users who will be a permanent administrator for the role (never have to activate). ✔️ Microsoft recommends you have zero standing administrator for all roles except for Global Administrators. Read more about it in the who should be made eligible and who should be permanently active section of this plan. Active admin For Azure resources, active administrator is the list of users who will never have to activate to use the role. This is not referred to as permanent administrator like in Azure AD roles because you can set an expiration time for when the user will lose this role. Active expiration An active role assignment for Azure resource roles expire after this configured time period. You can choose from 15 days, 1 month, 3 month, 6 month, 1 year or permanently active. Eligible expiration An eligible role assignment for Azure resource roles expire after this configured time period. You can choose from 15 days, 1 month, 3 month, 6 month, 1 year or permanently eligible. The foundation of proper planning is the basis upon which you can deploy an application successfully with Azure Active Directory. It provides intelligent security and integration that simplifies onboarding while reducing the time for successful deployments. This combination ensures that your application is integrated with ease while mitigating down time for your end users. Use this section to identify a set of users and or groups of users to validate the implementation. Based on the settings that you selected in the planning section, identify the users that you want to test for each role. ✔️ Microsoft recommends you make service owners of each Azure AD role to be the test users so they can become familiar with the process and become an internal advocator for the roll out. In this table, identify the test users that will verify that the settings for each role is working. Now that you have identified the test users, use this step to configure PIM for your test users. If your organization wants to incorporate PIM workflow into your own internal application instead of using PIM’s user interface inside the Azure portal, all the operations in PIM are also supported through our graph API. Configure the Azure AD role settings based on what you planned. 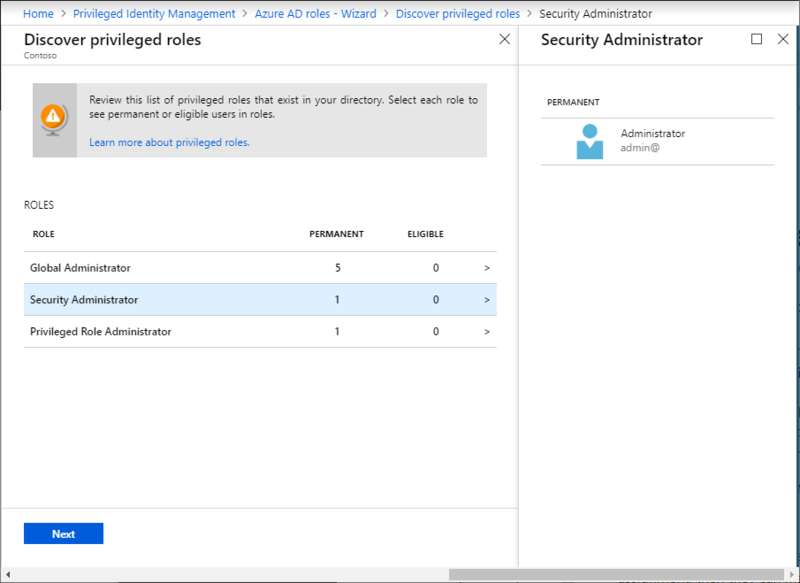 Navigate to Azure AD roles, click Roles, and then select the role you just configured. For the group of test users, if they are already a permanent administrator, you can make them eligible by searching for them and converting them from permanent to eligible by clicking the three dots on their row. If they don’t have the role assignments yet, you can make a new eligible assignment. Repeat steps 1-3 for all the roles you want to test. Once you have set up the test users, you should send them the link for how to activate their Azure AD role. Configure the Azure resource role settings for a role inside a subscription or resource that you want to test. Navigate to Azure resources for that subscription and click Roles, select the role you just configured. For the group of test users, if they are already an active administrator, you can make them eligible by searching for them and update their role assignment. If they don’t have the role yet, you can assign a new role. Once you have set up the test users, you should send them the link for how to activate their Azure resource role. You should use this stage to verify whether all the configuration you set up for the roles are working correctly. Use the following table to document your tests. You should also use this stage to optimize the communication with affected users. ✔️ Microsoft recommends you to set up time with your helpdesk/support team to walk them through the PIM workflow (if your organization has an internal IT support team). Provide them with the appropriate documentations as well as your contact information. Once your testing is complete and successful, move PIM to production by repeating all the steps in the testing phases for all the users of each role you defined in your PIM configuration. For PIM for Azure AD roles, organizations often test and roll out PIM for Global Administrators before testing and rolling out PIM for other roles. Meanwhile for Azure resource, organizations normally test and roll out PIM one Azure subscription at a time. Click Azure AD roles and then click Roles. For each role that you have configured, click the ellipsis (...) for all users with an eligible assignment. Click the Make permanent option to make the role assignment permanent. Click Azure resources and then click a subscription or resource you want to roll back. Successfully deploying PIM in production is a significant step forward in terms of securing your organization’s privileged identities. With the deployment of PIM comes additional PIM features that you should use for security and compliance. Click Azure AD roles and then click Alerts. ✔️ Microsoft recommends you deal with all alerts marked with high severity immediately. For medium and low severity alerts, you should stay informed and make changes if you believe there is a security threat. If any of the specific alerts aren’t useful or does not apply to your organization, you can always dismiss the alert on the alerts page. You can always revert this dismissal later in the Azure AD settings page. Access reviews are the best way for you to ask users assigned with privileged roles or specific reviewers whether each user need the privileged identity. Access reviews are great if you want to reduce attack surface and stay compliant. For more information about starting an access review, see Azure AD roles access reviews and Azure resource roles access reviews. For some organizations, performing periodic access review is required to stay compliant with laws and regulations while for others, access review is the best way to enforce the principal of least privilege throughout your organization. ✔️ Microsoft recommends you set up quarterly access reviews for all your Azure AD and Azure resource roles. In most cases, the reviewer for Azure AD roles is the users themselves while the reviewer for Azure resource roles is the owner of the subscription, which the role is in. However, it is often the case where companies have privileged accounts that are not linked with any particular person’s email address. In those cases, no one reads and reviews the access. You can access these audit logs if you are a Global Administrator or a privileged role administrator. For more information, see audit history for Azure AD roles and audit history for Azure resource roles. ✔️ Microsoft recommends you to have at least one administrator read through all audit events on a weekly basis and export your audit events on a monthly basis. If you want to automatically store your audit events for a longer period of time, PIM’s audit log is automatically synced into the Azure AD audit logs. ✔️ Microsoft recommends you to set up Azure log monitoring to archive audit events in an Azure storage account for the need of security and compliance.